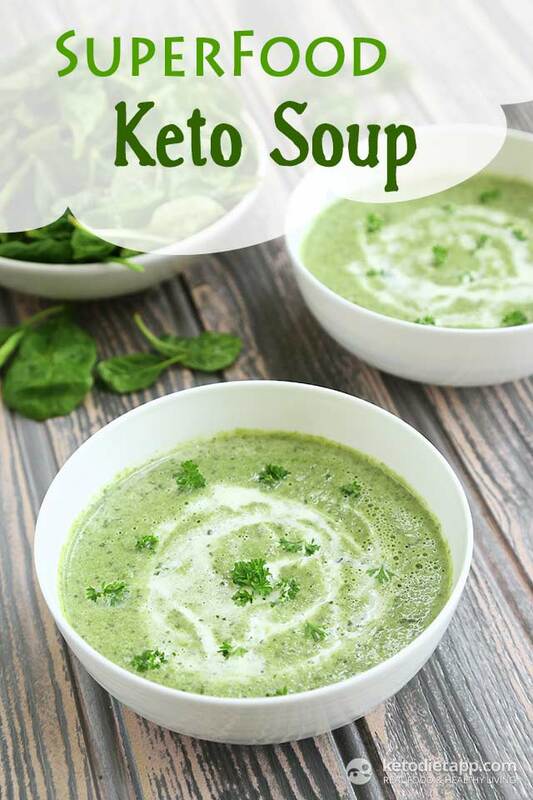 This recipe is great for a keto / paleo diet because it's low in carbs and very high in micronutrients. I used watercress, one of the most underestimated superfoods. 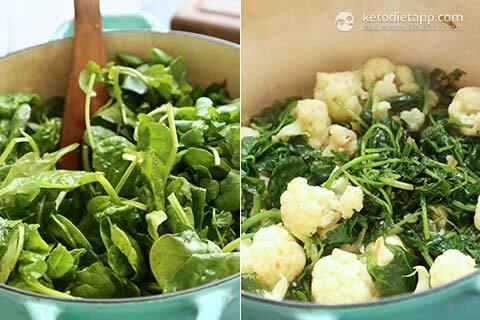 Together with Chinese cabbage, chard and spinach, it has the highest amounts of micronutrients amongst greens. It's high in antioxidants, vitamin A, B, C, E, K, magnesium, potassium and is one of the best non-dairy source of calcium. 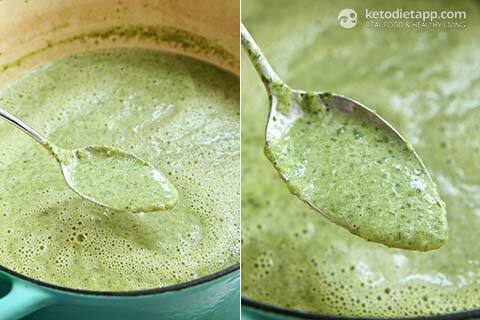 One serving of this soup will provide over 40% of your daily potassium and help you beat "keto" flu. For a vegetarian option, use vegetable stock. If you want to avoid dairy, use coconut milk instead. 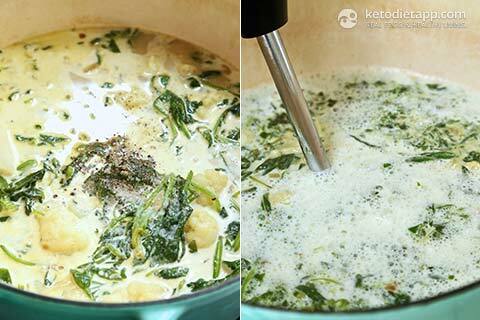 Try this creamy soup with low-carb bread such as Ultimate Keto Buns or Keto Breadsticks! Peel and finely dice the onion and garlic. Place in a soup pot or a Dutch oven greased with ghee and cook over a medium-high heat until slightly browned. 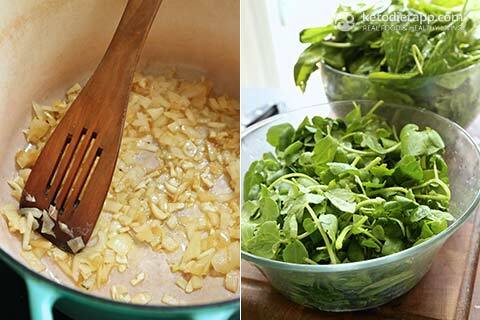 Wash the spinach and watercress and set aside. Pour in the vegetable stock and bring to a boil. 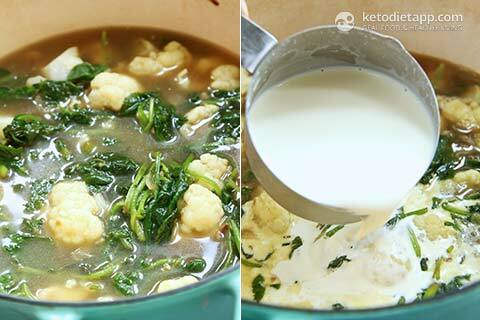 Cook until the cauliflower is crisp-tender and pour in the cream (or coconut milk). This soup is SO good! And super easy to put together -I even cheated and used frozen riced cauliflower. Just weighed it out to the grams you indicated in the ingredients and it all worked fine. My toddler even scarfed it up  Thank you! Hi Martina! Love this recipe and can’t wait to try it out! Just curious, will the soup taste different if it’s served unblended? Hi Maya, I think this depends on what you prefer. I personally like it blended as it makes the soup creamy. If you don't blend it, it will be more like stock. Where can I find watercress??? I live near what was once called the Watercress Capitol of the World. I havn't seen watercress in any store in years. This diet is so important for us. Hubby is T1 diabetic and developed a seizure disorder after a major brain hemorrhage. His seizures are controlled by a medicine that is processed in the liver. We lean toward a keto diet with a carb load nearer 70 gm of carb. I must be able to prove to his neuro doc that we know how o manage a keto diet so we can wean him off the seizure meds. Seizure meds are implicated as a cause for Alzheimer's We a mostly organic and We drink lots of green smoothies. Thanks for your app and recipes. Thank you very much for this recipe! My husband and I simply adore it. I think it will go into a bi-weekly rotation. I cannot easily find watercress. what could be used as a substitute? Just made this soup for dinner using beef broth. It is excellent! I normally don't like soup very much, but this really great. All of your recipes that we've tried so far have been fantastic. Just bought your fat bombs book. Thank you for all your hard work! I can't see how you got 392 calories per serving - when I calculate it, I get much less! When I added this all up and divided by 6 I got much less than 392. Is there something I'm missing? Thanks. Hi Alice, coconut milk is an alternative to cream. It works well as a substitute but is lower in fat and changes the nutrition facts - unless you use coconut cream (creamed coconut milk) that is higher in fat - that's why the nutritional facts don't match. I got slightly different results (622 kcal from coconut milk) - you may have used a different brand with less fat. Cream, on the other hand, will contribute to 1100 kcal (30-40% fat). Hey! Thanks for the clarification. I don't really understand how you got 622 or 1100, either. Mind sharing the numbers with me? Heavy whipping cream contains 878 kcal per cup, coconut milk contains 445 kcal per cup and coconut cream contains 792 kcal per cup. Keep in mind that nutrition facts for products will slightly vary. Additionally, if you are using an online/ shared / user-generated food database that is not verified like the USDA database, you may get different results. Where does it say that heavy whipping cream has 878 kcal/cup? I cannot find it. Secondly, I still do not understand how you obtain 392. Could you share with me the exact numbers you used? (100+46+9+6+17+46+288+468+878*(1+6/16))/6 = 351.83, not 392. Where am I going wrong? I'm sorry Alice but I'm too busy working on a book now. I used a verified database to calculate this - I'm sure it's correct. 350 vs 390 is actually not a big difference and is likely the result of inaccuracies in the other database. Maybe the cream you are using has different amount of fat (all it takes to add 40 kcal is 4 grams of fat). This is an awesome recipe it's a comfort food especially during the freezing cold days of winter!! Hi Brett, there are 392 calories per serving and one serving is about 1 1/2 cups (11-12 fl oz) based on the ingredients used. I bought a cheap one at Walmart that works nicely (hand-held immersion blender) and cost less than $20. 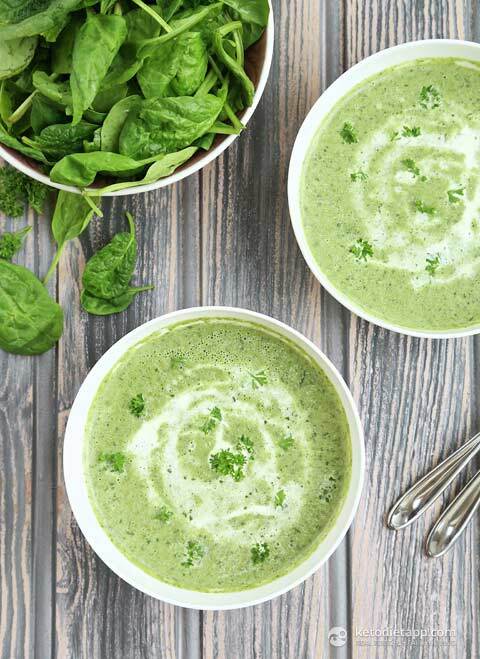 This soup looks so refreshing! 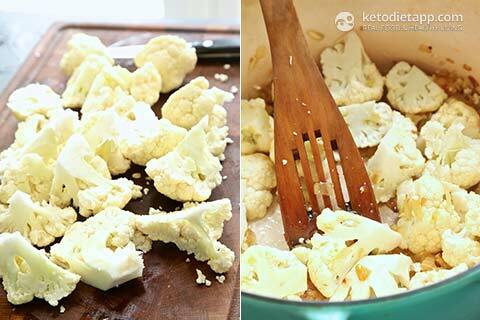 I started eating keto just 3 weeks ago, so this website is going to be a big help to me. I see that you have nutritional information, which is great (thank you! ), but I don't see how many servings this recipes makes or what amount a serving is. Can you help? Thanks so much! I've been suffering with flu and stomachache and was hardly able to eat anything. This soup has saved me and I couldn't get enough of it. Thank you so much for all your amazing recipes! This looks delicious. Is it supposed to be eaten as a cold soup?